Today we’re welcoming Clare Harvey to the blog and today is actually publication day for her book The Escape! Happy publication day, Clare! I hope you’re celebrating! Tell us a bit about you and your latest work. I fell into writing historical fiction when I discovered my mother-in-law was a girl soldier as a teenager in WW2 (which was the inspiration behind my debut, The Gunner Girl). I’ve had three wartime dramas published by Simon & Schuster, and my fourth, The Escape, is a two-timeline book set in 1945 in Germany, as the iron curtain falls, and in 1989, as the Berlin Wall is broached and the iron curtain begins to rise. How would you Twitter pitch your novel? The Escape is a fabulous read, and you should buy multiple copies for yourself, friends and relatives! What are your top 3 tips for aspiring writers? Are you a panster or plotter? I feel like I have to plot more rigorously since being published: the process of providing a synopsis and writing to deadline demands it(I don’t think my agent would put up with me ‘pantsing about’ too much, either!). I have a Nomination bracelet, and I let myself add a charm each time I have a book published, so I suppose success as an author would look like a bracelet full of charms. However, personal success means continuing to have a good relationship with my children as they become adults, so actually I’d say success looks like a photo of me hugging my grown up kids and knowing that the smiles on all our faces are genuine. How do you choose your character names? In my current book, The Escape, one of the main characters is named after a woman who bid for the privilege, in return for a generous donation to the Grenfell Tower Fund. What do you do when you get stuck with your writing? About a year from start to finish, depending on how much editing is necessary. What’s your main weakness as a writer e.g.SPaG, continuity etc? Attention to historical detail: I have had several emails from people telling me that there was no first class post in the 1940s, for example! What do you find hardest/easiest about writing? I love the writing itself. It’s the writing business that’s hard (thinking up ideas that publishers want to take, the insecurity of whether or not you’ll get another book deal, etc.). Describe your writing process in 3 words. If your book/one of your books got made into a film, who would play the main roles? Rachel Weisz would be perfect as Vera Atkins, if my second book, The English Agent, was made into a film. What’s been your biggest learning curve? It’s still going on, to be honest. Just when I think I know what I’m doing, everything goes pear shaped! Do you prefer pen and paper, or is everything on the computer? I always start out longhand, in fountain pen, on scrap paper. I like the feel of writing and I think the process allows you to cut out your internal editor and be more creative. I can touch type, though, so transcribing my notes isn’t too much of a chore. Who’s your favourite author and why? One of the first authors I fell in love with was Laura Ingalls Wilder, whose Little House on the Prairie books I read and re-read so many times as a child. The Tiger Who Came to Tea by Judith Kerr: I remember my mum reading this to me, and I read it to my own children too, when they were growing up. There is something deliciously anarchic about it. I still have a copy on my bookshelf. I have recently taken up life drawing again, which I love – two hours of drawing is better than therapy. I also run (and occasionally attempt a half marathon), which is good for stress-busting sanity, too. But I suppose the most relaxing thing is just chilling at home with my husband and children. Beer with curry, wine in the bath. Proper chip shop chips, with salt and vinegar. Puppies, always(kittens are cute, but they do grow up to become psychopathic bird killers…). Summer, because I’m a bit of a reptile – I like to feel the heat on my bones! THE ESCAPE: One winter morning in Germany in early 1945, Detta passes a group of exhausted British prisoners of war who are being force-marched westwards. One man catches her eye and she cannot forget him. The following day she receives an urgent message to contact the local priest: he needs her help. Miranda is a photographer in Berlin in 1989 as the Wall falls. Trapped in an abusive relationship, her one hope for escape is an old postcard of the village her grandmother, Detta, was born in. But as she flees through East Germany, Miranda begins to suspect the Stasi are following her…Two timelines, and two women who share a dark secret: can they save each other now the time has come to reveal it? 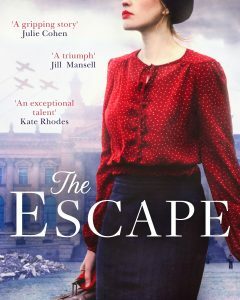 The Escape is Clare’s fourth compelling wartime novel. CLARE HARVEY was born in Devon, and spent part of her childhood living in Mauritius. 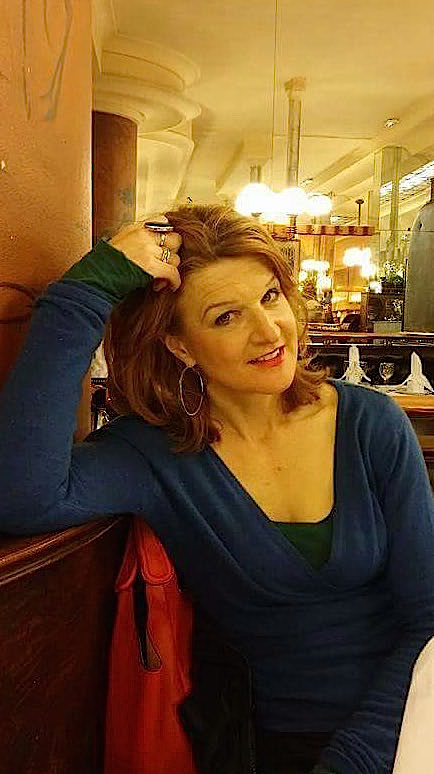 She has had an itinerant adulthood as the trailing spouse of a soldier, working in journalism, charity PR and English tuition in Northern Ireland, Germany and Nepal. Clare has three children and lives in Nottingham. Clare’s novel The Gunner Girl won the Exeter Novel Prize and the Joan Hessayon Award for debut romantic fiction.